The writer, comic book king, and the man who brought pleasure into so many lives for so many years through his 3000+ novels and comics. It is this artists' conclusion that there is a propensity of material spanning the 93 years of Gaylord Dubois's life. Numerous photos ranging from birth to death have been obtained along with letters, journals, articles and account records. Gaylord Dubois's history ranges from salesman, minister, school teacher, social worker, deputy sheriff to writer and scripter -- the career we all know him for. In his lifetime Dubois wrote over 3000 comic stories, more then 10 novels or adaptations (including the first Lone Ranger), at least 4 Little Blue Books, several volumes of poetry, 30+ Big Little Books and more. Comic scripting began as early as 1938 and continued until 1977 with a few stories published as late as 1995 and some still being published. Titles include Tarzan, Lost in Space, Roy Rogers, Turok, The Lone Ranger, Uncle Wiggily, Red Ryder, Brother's of the Spear, Tom and Jerry and Raggedy Ann. A more complete list will appear on this site in the near future. The location of the initial opening of this exhibition has yet to be determined. Tentatively we have been looking at Denver although it has been suggested Boston might be more fitting since Gaylord Dubois was a Boston 'home town boy'. He was born in Massachusetts in 1899 and died in Florida in 1993 at 94 years of age. During that time he traveled at great length throughout the US and Western Canada. It is expected the exhibition will be traveling to many of Gaylord's haunts throughout New York, Texas, New Mexico, California, Wyoming, Alberta and other places. After graduating from Boston University, Dubois returned to the Adirondacks where he had spent much of his childhood. In 1946 he, along with his wife Mary Van Alen, purchased a trailer and set off across the country in search of material for his writing. He spent many of his summers in the Peace River District of Alberta staying with his daughter and his grandchildren. These days, stories in which black and white adventurers treat each other as equals are such a familiar sight, they're scarcely even noticed. But a half-century ago, they were quite rare. The first such series in American comic books, however, was as little commented-on at the time as it would be today. That's probably because it ran unobtrusively in the rear of another hero's comic. But it was a very well circulated comic, and the feature ran there for a long time. The Dell comic book based on Edgar Rice Burroughs's Tarzan began in 1948. Postal regulations made it necessary that at least a few pages be devoted to features other than the one on the cover, so the back pages of Tarzan ran series such as "Mabu", "Two Against the Jungle" and "Boy" (the movie name of Tarzan's son, Korak). In the 25th issue (October, 1951), they hit on a winner with "Brothers of the Spear", which ran more than a quarter of a century, all told, and featured the first professional work of cartoonist Russ Manning. The series was created by writer Gaylord DuBois, one of the most prolific scripters in the history of comic books, and artist Jesse Marsh, whose highly stylized work was seen throughout the Dell line. They'd been the creative team on the Tarzan title almost since it began. The first episode occupied a mere six pages, but it launched a serialized story that eventually grew to epic proportions. Dan-El and Natongo, who took an oath of brotherhood at the very beginning, were both kings by right, whose thrones had been usurped. Restoring Dan-El in the kingdom of Aba-Zulu and Natongo in Tungelu occupied the first couple of years of the series. By the time it was done, both were married, Dan-El to the beautiful Tavane and Natongo to the equally beautiful Zulena. But neither affairs of state nor family duties had any effect on their love of adventure, and they had many more, one running smoothly into the next, over a period of years. "7 TARZAN: THE JESSE MARSH YEARS, Vol. 1, by Gaylord DuBois and Jesse Marsh. (Dark Horse, $49.95.) Witness the Golden Age adventures of Tarzan." The Lone Ranger by Gaylord Dubois. Based on the famous radio adventure series by Fran Striker. - DUBOIS, GAYLORD. The Lone Ranger by Gaylord Dubois. Based on the famous radio adventure series by Fran Striker. - DUBOIS, GAYLORD. : "DUBOIS, GAYLORD. The Lone Ranger by Gaylord Dubois. Based on the famous radio adventure series by Fran Striker. New York, Grosset & Dunlap Publishers [c1936].. Orange cloth lettered and decorated in red. Cloth covers lightly soiled, slight wear to the extremities, otherwise very good. Presumed third printing with both Dubois and Striker named on the title-page. The first Lone Ranger book. This printing issued before Dubois' name was completely removed from the title-page (this occurred with the fourth printing according to Firsts magazine, July/August 1993). Striker's name on the spine and front cover." Gaylord Dubois worked as a writer for over 30 years with Western Publishing. A graduate of Boston University and General Theological Seminary, his works were always wholesome, family fare. He wrote Big Little Books and novels as well as contributing to the majority of non-Disney 'adventure' comic books bearing the Dell imprint. 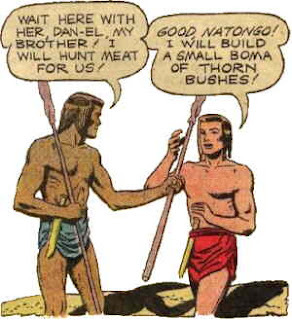 Dubois wrote or adapted almost every Tarzan lead story in Dell from 1947 to 1971 as well as the majority of backup features including the popular 'Brothers of the Spear' from 1950 to 1960." Buck's real name was Charles Frederick Gebhart, and his oft reported birth dates and birth place is December 4, 1889 or December 12, 1891 in a 'small house on the outskirts of Vincennes, Indiana'. Buck's parents are generally identified as Charles and Evelyn Showers Gebhart. Apparently, there is no birth certificate or other documentation to confirm Buck's real birth date. Communiques to the Knox County, Indiana Health Department (Vincennes, Indiana) resulted in a reply of 'no record found'. The Vincennes Chamber of Commerce replied that December 12, 1891 was the date they have. Am checking some other Vincennes sources, and will report if I have any luck ... but am not optimistic as other western film historians and authors have tried to locate a birth certificate and failed." Lightning Bill Carson stood in the saloon doorway, letting the batwing door flip behind him. His austere presence, set off by his high peaked Stetson, dark shirt, and pants, was made more imposing by his icy cold stare fixed on the men standing at the bar. The room, which had been filled with the tinkling of a piano and men’s conversation a moment before, was now silent with hushed anticipation. Suddenly, "Blackie", one of the men at the bar reached for his six-gun. It never cleared the holster. Carson’s .45 spoke first and Blackie, wanted by every lawman in the West, lay on the floor. This typical scene was part of every Tim McCoy B-western of the late Thirties and early Forties. He wasn’t always Lightning Bill Carson, cowboy G-Man. Sometimes he was Trigger Tim Rand, or U.S. Marshal Tim McCall, one of the Rough Riders. Regardless of his name, when he appeared on the screen, Saturday matinee kids knew they were in for thrills and excitement. The man who became Buffalo Bill’s successor in the field of bringing live wild west show entertainment to the American public, was born to Irish immigrants in Saginaw, Michigan, April 10, 1891. Growing up, McCoy heard stories about the early settlers, the Indians, and the Civil War, from people who had lived during those times. Those stories, combined with his interest in history, inherited from his father, prepared him for his future career." The link above goes to to the book 'Ideal Metrology' by Hermon Gaylord Wood -- Gaylord DuBois's grandfather. 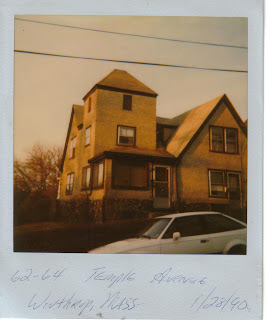 He built the house in Winthrop, Massachusetts that Gaylord was born in. He was an architect, designing and building many churches, and also has items registered in the patent office. The book "Ideal Metrology" was published in 1908. If the link above does not take you to the book you can go to Google Books and search for Ideal Metrology. The entire book is available online. It is a daunting task sorting through all of the letters and information I have gathered on grandpa but it has the rewards of tracing out the family tree. Of course names have caused some confusion at times but it is all coming together. I added the photo above to the photo album on webshots but have not yet named or otherwise identified the photos. As I do sort them out I'll add names or approximate dates. This photo was one that was a little easier to identify since it was marked on the back. The name of the lady in the photo is Nancy Ashby Merritt. She is the great grandmother of the signer, E M Wood. I believe this to be Elizabeth M Wood, the daughter of Hermon Gaylord Wood. 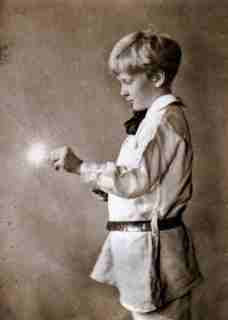 Hermon Gaylord Wood married Mary Elizabeth Luff and when he died in 1913 he was survived by his wife and two daughters. The daughters were Miss Elizabeth M Wood and Mrs Cornelius (Mary) Dubois, Gaylord Dubois' mother, and the one I have known to be called Gran Dubois. 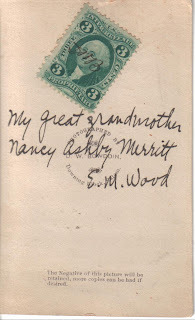 The daughter Elizabeth M Wood, who has signed the back of the photo, would be the one I have known as Aunt Betty Wood. 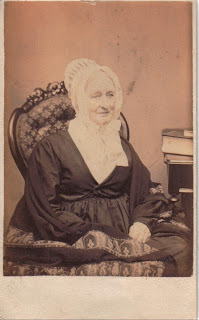 The lady in the photo, by my calculations, is therefore the Great-great grandmother of Gaylord Dubois. 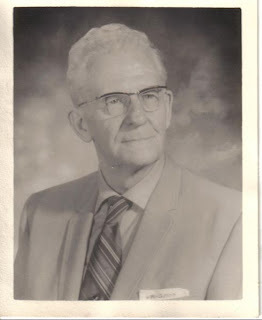 "Gaylord McIlvaine Du Bois (as it appears on his baptism certificate), or DuBois (He signed it both ways: as two words, both capitalized; and as one word with a capital 'B') (b. August 24, 1899 Winthrop, Massachusetts – d. October 20, 1993 Orange City, Florida) In his lifetime he wrote well over 3000 comic book stories and comic strips as well as Big Little Books and juvenile adventure novels." n.b. Once upon a time I made an ambitious attempt at getting a biography on grandpa started in Wikipedia. After tremendous problems getting references to work I wandered off and left it with only half of the information even visible. I can only begin to express how thrilled I was to discover that there are knowledgeable and ambitious people people in this world to take over. The article is much larger now -- well worth the read. Thank you so much to David Porta, Kross, Stephen Day and all the others who have contributed to and made edits and corrections on this article. I am a granddaughter of Gaylord M Du Bois and I am currently trying to organize and research grandpa's life and writing history. My plan is an exhibition and since I am a visual artist it will likely be portrayed in an artistic manner rather than just panels of information. I have had a couple of offers for an opening venue but have still not made any firm committments. Grandpa was born in Massachusetts, died in Florida, lived in New York and the Adirondacks, and also was a deputy sheriff in Wyoming. He toured Texas and New Mexico extensively and spent many summers in the Peace River Country of Alberta. I had thought a central location for the initial exhibition but I am still open to suggestions. I am also open to any information any readers care to share about Gaylord Dubois' writing, ministry, travel or anything else related to his life. There is a google button below that will allow you to email me directly -- or you can just add your comments on any post.